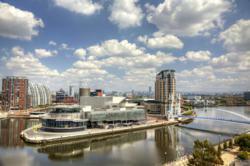 Salford enjoys property boom following BBC’s move to the city. The high profile move of the BBC to Salford has led to a massive property boom in the city, with house prices rising four times quicker than anywhere else in the country. The average home in Salford is now worth £91,508, up 6.8 per cent on a year ago - the largest price increase in any part of Britain outside the capital. House prices in the North West averagely fell by 3.5 per cent, adding to the evidence that the Salford property market has been buoyed by the arrival of the BBC at the MediaCityUK complex. Over 2,000 BBC staff have now moved to Salford and many of the channel’s programmes are filmed in the media centre, located in Salford Quays. ITV also recently completed a move to set up home at MediaCityUK and already broadcast programmes such as Granada Reports from the media hub; they also have planned to completely re-build the set of Coronation Street in Salford Quays. Property firm Knight Knox International is located in Salford Quays and the company has seen directly the effect of the media giants’ move to Salford – one of their developments X1 Salford Quays, which is a 60-unit project, has already nearly sold out, after only being on the market for seven months. Their latest development in Salford – Chapel Street, has just been launched by the property firm and the company is advising investors to take advantage of the boom, by investing in this new opportunity. Knight Knox International offers an extensive range of property and services worldwide. Established in 2004, the company has sold over 4,000 properties across 50 countries. If you are interested in the properties and would like to see what other properties we have available please contact +44 (0)161 772 1370. *Extract adapted from mail online.